My arms hurt. In fact, my whole body hurts. I just got out of my garden. It doesn’t really look like a garden right now–we tilled up a patch of grass. But its raw dirt (okay, mostly clay right now) but it is mine and I get to grow food for my family. 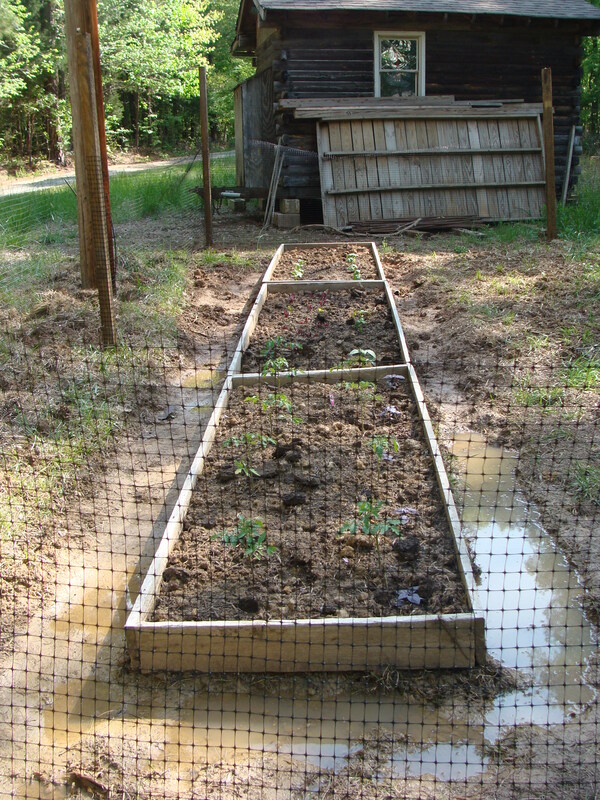 I thought I would blog about my garden project because I figured there are other budding homesteaders, like me who are wanting a garden too and need moral support. Gardening is more than just summer veggies. Gardening is my Prozac. Gardening is my Church. Gardening is my Patriotic contribution. Gardening is my Health Care. 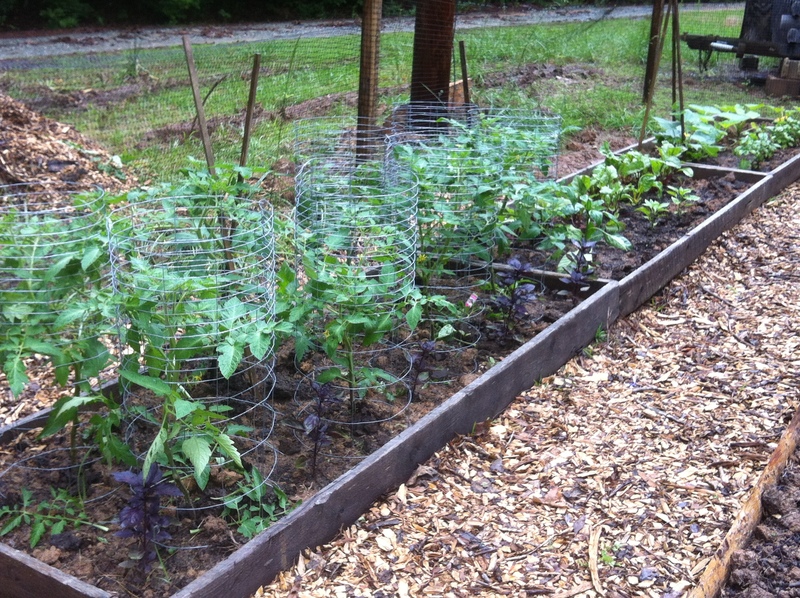 A good garden is the life-blood of the homestead healthcare experience. “Let your food be your medicine, and your medicine your food” –Hippocrates. This famous quotes carries as much weight today, as it did then. Good nutrition is the number one foundation for good health. A garden gives you superior nutrition (not to mention taste). Did you know that the vegetables of today in some instances have 37% less vitamins and minerals in them then they did in the 1050s! This is partly due to soil depletion, but a study published in 2004 in the Journal of the American College of Nutrition, cited that this depletion primarily is a result of genetic manipulation for uniformity and pest resistance, not nutritional value. 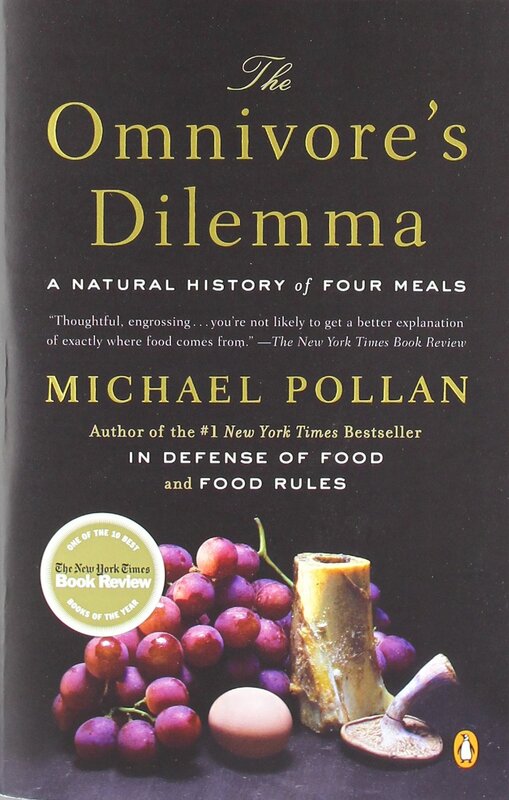 There are solutions to this serious nutritional crisis. BRING BACK VICTORY GARDENS! 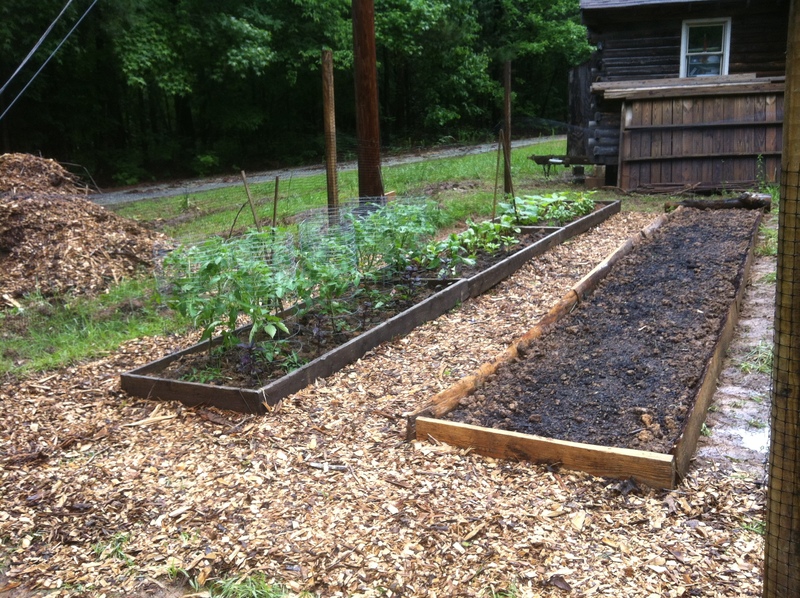 During World War II, Americans were encouraged to plant family gardens to help offset food rations. These were known as Victory Gardens. Today, every family should be encouraged to plant a victory garden, but for another reason: nutrition and non genetically manipulated foods. Many countries have completely banned GMO crops because they are concerned about the health risks, ALSO they are concerned about pollen contamination with GMO. Cross pollination with GMOs causes corruption in the seeds of heirloom plants! There is the risk that over time, plants would lose the ability to reproduce themselves. There are other issues as well, that the corporate Giants who hold the patent on these GMOs have sued and won cases against farmers for copy-right infringement because of pollen drifting. This is why we need to bring back victory gardens because we are engaged in a new war, one where biological weapons of mass destruction are being used against us AND overt control over the food supply. So, that is why Brandon and I are tilling up our grass, mucking though the NC clay, and painstakingly putting in an Heirloom vegetable garden. It is our labor of love–for family and country! Here in NC we had our first week of hot weather. Spring had rushed in, better late than never. Birds were chirping, bees buzzing, flowers popping and pollen flying. The sun shone with clear purpose and I was in a bad mood. In fact, despite the wonderful weather–everyone seemed grumpy. While I was actively avoiding my loved ones, I picked up a book and was reminded of the basis of all the irritation: Spring fever, literally. 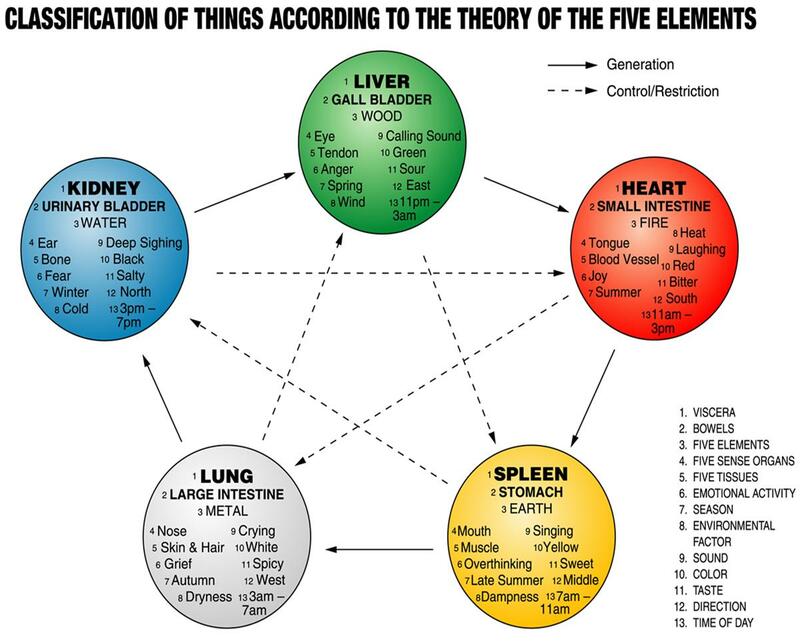 Traditional Chinese Medicine (TCM) offers a cosmological system called Five Element Theory. Within their system, health is directly influenced by the energetic shifts of the natural world, as well by the internal (physical) environment. When we look at the below chart, we see that the season that corresponds with the Liver (network) is spring-time. The liver is connected with the Wood element, the emotion of the Liver is anger (interesting….) the senses associated are vision and the taste of sour. So, what does this mean for my grouchy mood? Let’s break this down…. The energy of spring is rushing, vibrant, the fever pitch of nature coming to life again. Our physical bodies also waking up, the heat of the sun warming our bodies and causing an increase in atomic vibration. Our energy is moving faster and in TCM, the Liver network is responsible for the smooth flow of energy. 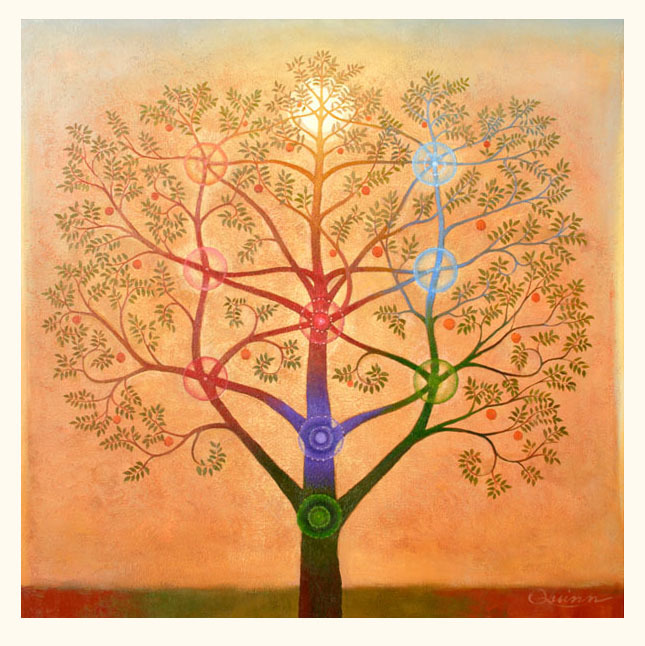 If our Liver is not in top shape (cold/flu, too many Christmas cookies, tax time, etc) then it may not be able to command the flow of spring energy giving rise to internal heat and wind (allergies, headaches), anger, insomnia and other issues. Interestingly, traditional medicine has always used the spring time, as a natural time for detoxification, with special focus on the liver and lymphatic system. The first spring herbs are full of nutrients, but also have special diuretic and detoxification properties, some also have antihistamine constituents that help with seasonal allergies. Mother Nature is offering us the exact medicine we need to prepare our bodies for the spring rush. Many of us also feel an innate desire to spring-clean our bodies–getting rid of excess winter weight, becoming more active and social. I came home and shared this information with Brandon. It made sense to him, he had been grumpy too. We decided to do an experiment: drinking an herbal tea to support the liver to see if we could cool the fever from the liver. We mixed Dandelion leaf, Nettle Leaf, and Peppermint to make the tea. Our formula well balanced for liver-fire. The dandelion and nettle both have a slightly sour taste (which is the taste to balance Liver). They are also nutritive and work as both diuretics and mild detoxifiers. Their energy is cool and soothing. The Peppermint is very cooling and helps to take the kinetic energy out of the nervous system. We both found the tea to be very satisfying and we both felt more calm. I was humbled to be reminded that I am not apart from the natural world, but am more influenced by it then my consciousness knows. By looking in my backyard apothecary at the plethora of spring medicine there, the herbs inspired my conscience-awareness. Lightly infuse herbs and mix with local honey for added immune enhancement. 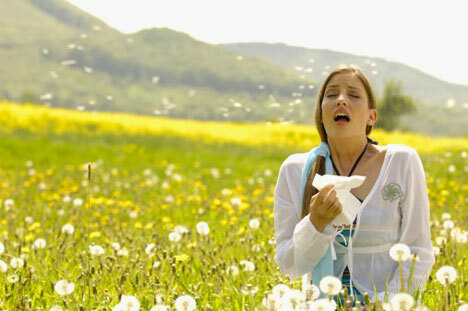 Are seasonal allergies keeping you from stopping to smell the flowers, or anything else out doors during the spring time? Chronic Stress. Chronic internal inflammation. Environmental Pollution. Chronic stress keeps the body in a continual state of degeneration. When stressed, endocrine functioning is taxed (and can eventually “burn-out”), digestion and assimilation of nutrients is impaired, glucose functioning can become imbalanced, the immune system becomes dis-regulated, natural detoxification is slowed. Not to mention, sleep, mood, focus goes right out the window, which makes it more difficult to get though the day and stress builds. Its an on going cycle. ALL of the ABOVE contribute to chronic pro-inflammatory status. Many health professionals (including myself) feel that chronic inflammation is the primary instigator of degenerative illness. Allergies are like the proverbial “canary in the coal mine”. They are an in-your-face (pardon the pun) way to let you know its time to change your lifestyle. Histamine begets inflammation, and inflammation begets histamine. It can be a snow ball effect. The body has natural compounds that help to regulate immune response and the liver is responsible for metabolizing histamines. But, if there are impediments such as liver congestion or ongoing life-stress, then this process can be impaired. Too much histamine can stay active in the body–starting the inflammation process over again…. It is no secret–more people are suffering from allergic rhinitis than ever before. Many, have lived their whole lives without allergies, only to now have them. They want to know why, and so do I! I cannot substantiate this with good research (yet), but it is my professional opinion that environmental pollution is a huge contributor to seasonal allergies, along with genetically modified plant pollens. We do know, that thousands of environmental pollutants we are exposed to daily are endocrine disruptors, carcinogenic, AND immune dis regulators. I cannot help but be highly suspicious…. Deactivate stress response. Down-regulate inflammation. Reinforce health. I cannot begin to emphasize how important it is to have productive ways of reducing stress. I know, I know. I live a crazy life too. But, it is crucial to being happy, productive, AND HEALTHY! Keeping stress response under control is going to go a long way in keeping inflammation down. Those two things help to reinforce good health and well-being. Good nutrition, and healthy habits: sleep,emotional intelligence and hygiene are all basic building blocks to good health. Nature has provided us an amazing apothecary to help with this. Guess what? Greens leaves and bright colored fruits have vitamins, mineral, bioflavanoids and antioxidants that ALL help with the above issues. (I’m sure you knew that already). Remember “Rainbow” eating. Don’t forget that CLEAN meats and fats support mental and endocrine functioning…. Go for a walk by a shady river. It will help with stress relief, and you will likely find Stinging Nettles. Stinging Nettles have been used traditionally as a seasonal allergy remedy. It is a short-acting antihistamine, highly nutritive and promotes detoxification. Many spring- edibles such as: purple deadnettle, chickweed, cleavers, violets, onions can all help with histamine response, detoxification, and nutritive support. I encourage you to use them in salads and cooking. Huang Qin (Baical Skullcap) is a very effective antihistamine and immuno-regulator. It is used in TCM, but wildly available here. 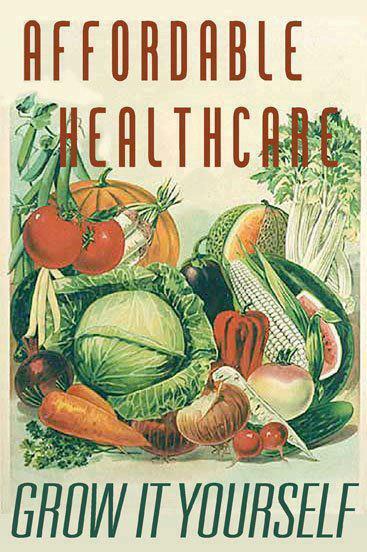 I definably recommend it to be part of your Homestead Healthcare medicine chest. Herbal Adaptogens are a classification of herbs that help the body be able to adapt to stressors. Many of them support organic functioning, immuno-regulation, resistance and endurance. Because we do not have a physical remedy against environmental pollution, I believe that Adaptogentic herbs can help us “adapt” to our environment. Holy Basil is an adaptogen that could be very helpful with allergic rhinitis. There are many other herbs that can be tailored to fit your specific allergic patterns. I am a HUGE fan of liver detoxification to help with proper immune functioning, histamine metabolism, inflammation and reactive-load. Netti Pot with medicinal herbal tea or essential oils. I am a firm believer in not-suffering. If you need over the counter medications to help with acute allergic symptoms, take them with care. I would encourage you to look beyond symptoms to the underlying cause of your allergies. Nature provides remedy, not just symptom control. I know this, because I used to suffer from horrendous environmental allergies. I had years of conventional therapies such as allergy shots with no help. I have always loved spring time, but had to watch it from behind a window in my air-controlled home. Using natural therapies, I changed my sensitivity and immune response. Now, I stop to smell the flowers every chance I get. Glechoma hederacea is originally from Europe. It is in the Lamiaceae family (Mints). It is considered an invasive plant (although why would anyone consider such a powerful medicinal unwanted??? ), and grows in most temperate zones, and is one of the first spring plants to flower. Medicinally, it is a powerhouse! One of it’s very unique properties is Luteolin which is antiviral (modern medicines virtually have nothing that fights viruses), making it very specific for colds and flu. It is also an expectorant, anti inflammatory and antioxidant. 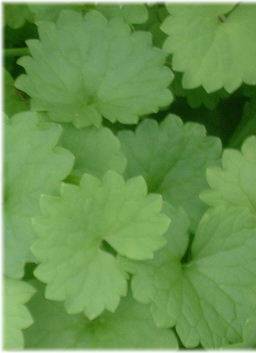 Herbalists consider this plant to be specific for Hot/damp (infection) lung conditions. Mucus will be thick, yellow or green. David Winston uses it for infections with persistent coughing (sound like this year’s super cold!) and allergic rhinitis, sinusitis. I find it very interesting taking Doctrine of Signatures into consideration, the leaflets look a bit like the lung system. P.S. Topically, Ground Ivy can be made into a poultice for insect bites, bruises, and active herpes lesions. 1 Tbs per 6-8 oz of boiling water. Steep 10 minuets, add local wildflower honey. Drink 2-3 times daily while acute.